FILE - A man washes his face outside a shelter for displaced foreigners in east of Johannesburg, South Africa, April 21, 2015. As many as 3.5 million people in Africa were uprooted from their homes in 2015 because of conflict and natural disasters and left stranded in their own countries, with many governments overlooking this growing problem, a report released Friday said. Figures from the Internal Displacement Monitoring Center showed an average of 9,500 people fled their homes daily last year, bringing the total number of Africans displaced internally to 12.4 million, with the number set to rise in 2016. The country affected most was Nigeria, with as many as 736,000 fleeing their homes in 2015 as a result of violence associated with the Boko Haram militant Islamist insurgency. The report calculated that the number of internally displaced people was double the number of the continent's refugees, estimated by the United Nations to have reached 5.4 million in 2015, highlighting the scale of Africa's comparatively overlooked "internal displacement crisis." While refugees are the responsibility of the international community, people displaced within their own country are the responsibility of national governments. 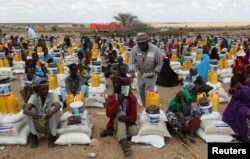 FILE - Internally displaced people receive assistance from African Muslim Agency near Adbuqadir town of Awdal region, Somaliland, April 11, 2016. Across the Horn of Africa, millions have been hit by the severe El Nino-related drought. "Many of these governments are not even aware of the scale of the problem within their own borders," said Alexandra Bilak, IDMC director, told the Thomson Reuters Foundation in an interview. "They need to take up their responsibilities and actually keep track of these people." The figures for the first half of 2016 were likely to be at least as high, with ongoing conflicts in countries like South Sudan, the Democratic Republic of the Congo and Nigeria, Bilak said. The report's publication marked the anniversary of the Kampala Convention, Africa's landmark commitment to preventing displacement and protecting the rights of IDPs, signed in 2009 and now ratified by 25 countries. It argued better data were needed, especially on people driven from their homes by slow-onset crises such as a drought, and that this was crucial if governments were to meet their commitments. "Reliable data on population movements is vital to ensure a timely and well-targeted operational and policy response," the report said. 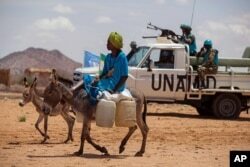 FILE - A man rides his donkey past Tanzanian UNAMID troops standing guard at a camp for internally displaced people in Khor Abeche, South Darfur, Sudan, June 30, 2014. The IDMC hoped the report would be a reminder that while the continent's refugee crisis has attracted international attention in recent years, the problem of huge numbers of Africans uprooted from their homes but temporarily settled in their own countries was not new. "The same people remain on our books, year in, year out. The numbers are not going down," said Bilak. The report drew attention to "off-the-radar" displacement in countries like Ethiopia and Malawi, which, while relatively stable, suffer slow-moving environmental challenges such as drought that are "blind spots" for policymakers. A third of African countries are prone to drought, and most are increasingly vulnerable as result of climate change. The report also highlighted the role of southern Africa's worst agricultural drought in 35 years — and resulting severe food shortages — in driving people from their homes in 2015. The report also emphasized the need for African governments to recognize the role of development projects in causing the sort of "off-the-radar" displacement, with people evicted from slums to make way for infrastucture. All too often "the impact of development projects and business activities on the people they force from their homes and livelihoods is not visible to policymakers," the report said.